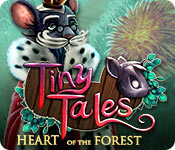 Brave Giant proudly presents Tiny Tales: Heart of the Forest! Tiny Tales: Heart of the Forest is rated 4.1 out of 5 by 14. Rated 5 out of 5 by ninja226 from Refreshingly charming and childlike The demo for this game doesn't do it justice. You need to play the entire game to appreciate the artistry. It has the best video intro I've seen in a while. The story is refreshing from the usual spooky mansion, murdering villains littering the HOP landscape. It's a combination of Lilliputia and Wind in the Willows where the little animals speak and transport you to locations in the forest. You have to create spells (when the spell book at lower left corner glows, it's time to create a spell) in order to vanquish the villain, appropriately named Rattus. The HOPs have occasional morphing objects, not many in SE, but present. The puzzles range from easy to mildly challenging. There are also quite a few eye hand coordination games like hit the target, moving right-left to avoid objects or keep your balance. The artwork for the game is superb--beautiful, sharp, high def and magical. Some of the drawings for the background story are crude, but the story itself is easy to follow and timeless. This is a game that has to be played to the end to appreciate. Rated 5 out of 5 by gamesrgreatfun from A Fun Whimsical Tale I enjoyed this game immensely! The graphics were so enchanting in each scene that I looked around before completing the tasks at hand! The story was intriguing and engaging. There was a villain and a hero (me, of course). There were no ghosts or demons in sight! It was a delight to play from beginning to end. I am going to replay this game with my granddaughters, I'm positive they will like it as much as I did! (And it is family friendly) However, I really wish I had bought the collector's edition so I could have wallpaper for my computer from some of the scenes! Rated 5 out of 5 by skullfun from MAGIC HAPPENS WHEN OUTSTANDING CREATIVITY MEETS IMPECCABLE EXECUTION! 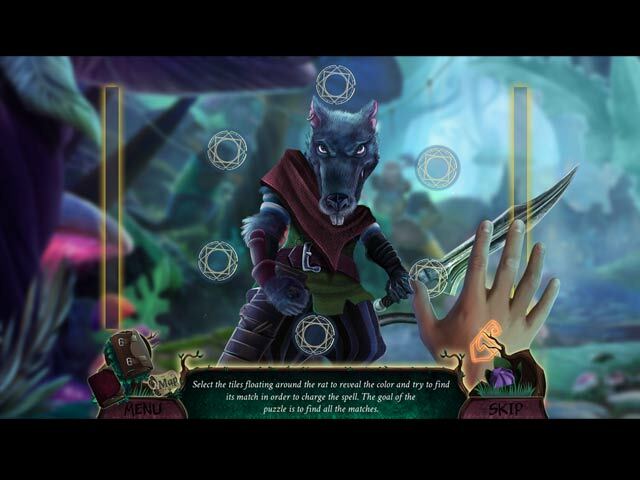 Two leading developers in the realm of HOPA games, Brave Giant and Artifex Mundi, have joined to create a new fantasy adventure. But before you sigh with frustration at the thought of yet another fantasy series, be assured that Tiny Tales is a fantasy HOPA like no other. There are no fairies or evil witches, but rather, giant animals and talking furry friends. Follow Max, a miniature-size human, who lives in the tiny kingdom among the mice as he navigates through an archery competition on his way to save the world! At first, I was skeptical of Tiny Tales: Heart of the Forest so I waited for the SE version. Even though the premise of the game sounded refreshing and exciting, I was worried that the game would turn out to be too cheesy for my taste. To my surprise, Tiny Tales remains unbelievably cute, while does not venture too far in the cheese zone. The storytelling in the game is also on-point, with just enough characters to keep me engaged, but not feel overwhelmed. The unexpected complexity of the gameplay is another pleasant surprise in Tiny Tales: Heart of the Forest. The main portion of the gameplay does not necessarily break the traditional mold, but the challenge that comes with it is definitely more than welcomed. 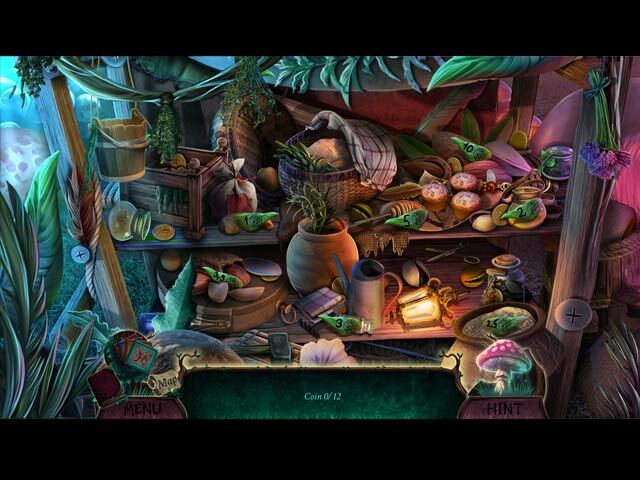 Moreover, the hidden object scenes and the puzzles are well-executed – they offer enough variety and creativity that always leave us wanting more. Apparently, Max is also equipped with the power to use all sorts of magical spells. These spells are useful and can be unlocked through the Spell Book, an example of an extra feature that is effective and does not feel too “extra”. Like all the game from Artifex Mundi and Brave Giant, Tiny Tales: Heart of the Forest offers satisfying sights and sounds. The artwork is imaginative, vibrant, and precise. The quality of the graphics is second-to-none. The soundtracks are appropriate and epic, without being overbearing. The voice-acting represents the characters extremely well. Tiny Tales is basically faultless when it comes to its production. Like other reviewers, I too am anxious to see this game become a series like "Ghost Files, Queen's Quest, and Demon Hunter" just to name a few. Cheers! Rated 5 out of 5 by smilingsun72 from Brilliantly Charming! 5 Magical stars! Completed SE: This is magically charming all the way through. I enjoyed every bit of the story, characters, scenes, music, puzzles, etc. I was equally impressed at how refreshing this game was from what has been appearing on BF recently. I can honestly say it is nice to see a bright change that any age group can enjoy. I highly recommend this game! (I can't wait for the next installment.) Basic run down on game: STORY: Max is a tiny human that has been searching for his father. He returns home to find a bad rat has been doing bad things to people. He enters an event that leads him on an adventure to rescue the mouse princess. SCENES & MUSIC: Bright, beautiful scenes that are easy on the eyes and soothing to the soul. The music score it superb.The cut scenes are perfect and timely. PUZZLES: A variety of well placed activities that fit so well into the game they feel like they belong. CHARACTERS AND VOICE ACTING: All charming and the voice acting is awesome! Rated 5 out of 5 by blipi69 from Great Game I really enjoyed it. Some surprises in the Story - more than average HOPA. Rated 5 out of 5 by GogaO from A STUNNING GAME Very cute and interesting game with gorgeous graphics and a new theme. I just loved it and played it for hours. Kudos to developer! . Rated 5 out of 5 by ADamselInDesign from Huge Adventure Awaits You in a Tiny World! ***Review of Completed Game*** First, this is a review of the completed game. I *never* review demos as it would be the equivalent of reviewing a surgeon's work before he's even finished with your operation—basically, it is utterly pointless and ridiculous! A game can change drastically after a single hour of gameplay and by reviewing just the hour-long demo, you are honestly doing a disservice to both the game developers *and* to other gamers. Now, on to the review: Tiny Tales: Heart of the Forest is an absolute delight in many ways. From the outstanding graphics, intriguing storyline, and innovative gameplay, Tiny Tales has proven to be anything but tiny in its offerings. The graphics are probably my favorite aspect of this game, and that may be partly because of my being a professional digital artist, myself, who creates art for book covers as well as for games. My bias aside, however, the tiny little world that Brave Giants has created kept me smiling throughout the entire gameplay. The environment is reminiscent of Disney's Honey I Shrunk the Kids, Tom Thumb, Thumbelina, The Borrower's, and The Secret World of Arrietty. The architecture was made from our everyday items and was adorable and clever. Chess pieces making up columns, match sticks being used as rungs on a ladder, spools of thread used as part of a well, a needle and thread making up a partition barrier… everything was just so creative and really makes your inner child come alive. The bright, vibrant colors of the various flora and fauna, which at times reminded me of Alice's Adventures in Wonderland—especially in regards to the mushrooms and toadstools that looked massive compared to our tiny character—really helped create the fantasy, fairytale world that you really don't want to leave. The main game character we play in Tiny Tales is a tiny man named Max. The addition of a male protagonist—who even ends up saving another female character numerous times—is such a nice change of pace from all of the games where we are female and must ultimately save our "damsel in distress" husband/fiance/boyfriend repeatedly, or even our son/daughter, from the clutches of evil. It is like these game developers often forget that not only mom's play these games. There are many single women with no children, as well as single men and fathers, who play these and I am sure I am far from the only gamer tired of having to play the part of a mother saving her child, or a wife/girlfriend saving her man that so many developers create just to look "progressive." I really wish more games would allow you to choose your character's gender. As far as the gameplay goes, as someone who has played over 250 BFG games, I have seen and done it all. So, I was very pleased that the HOG's within Tiny Tales were not all the standard straight list style. The different HOG's within the game varied, and the scenes were logical for the game's theme and environment—no floating hamburgers in the sky, or unmelted ice cream cones in the trunk of a car! Also, there is an alternative to the HOG where you must match two like symbols that many will enjoy; I did play the alternative a couple of times. The minigames were clever and were just challenging enough to not really require any walkthroughs. They should be fairly suitable to gamers of all ages, skill level, and experience. The music could become rather monotonous, but I just turned the music volume down, considerably, and it helped. There are the standard options when choosing game difficulty, and the Custom option is available, as well. Overall, this game is an adorable way to spend an afternoon if you want or need a fun way to destress and unwind. Give it a shot; it surely won't disappoint! Oh, I am wondering… was I the only person to notice that Max's father, Heath Thaddius, is apparently a Stark bannerman? At least, he is if you go by the statue of him in the game that shows him sporting a House Stark shield from HBO's Game of Thones, that is! Rated 4 out of 5 by playinthewaves from Cute game, good for an afternoon. OK for a younger audience A cute and serviceable little game. I have some additional things to say but I definitely recommend this game if you are looking for a light-hearted fantasy adventure that might be suitable to play with young'uns. I do not recommend it to reviewers looking for brain-cramping levels of challenge - I'm a casual player by choice and even for me it was maybe a little bit too easy. +/- Cartoon violence only! I think I'm not the first reviewer to say that, as much as the blood and gore is occasionally exciting, the HO genre tends to be saturated with fairly grisly murder cases. I'm a big fan of grisly murder cases, but I'm also a big fan of the softer games and I like playing my way through something friendly. (No murder cases for me after 9PM. I like sleeping through the night!) I think this isn't very scary and would be good if you have a small friend (child, babysittee, grandchild, niece/nephew, whomever) to play with. +/- Black and white storyline. The good characters are good, and the evil characters are evil. No tawdry business or "cool motive, still murder" here - the baddies are bad and the good guys are good. Only one character breaks this mold a tiny bit - I won't tell you who, because spoilers - but it felt a little bit clumsy to me while the rest of the story was so...simple. I personally felt this was a minus, but to those reviewers playing with little ones, I think it's probably a plus. - Here is my only real, solid complaint - the graphics and sound are 99% awesome. The HO scenes are actually fun (I like Match 3 options and adventure-style mini-games better, sue me). My singular problem with them is that, when you were in a scene that asked you to find multiples of an item (eg 11/11 bottlecaps to find), the game was a little bit slow to respond in crossing items off of your "found" list. I have two laptops, including a souped-up gaming laptop with a very high processing speed, so I think this is just a mechanics thing. I found it to be minorly annoying but it didn't detract from my enjoyment of the game much; just gave me a little moment of pause occasionally when I was looking around for an item I'd actually already gotten. -Tiny bit short. Again, because of the challenge level, this was not a crazy-long game. I think it took me about three and a half hours to finish, but only because I was multi-tasking - I think if I'd sat down and played it in one go I could've finished it in two. Rated 4 out of 5 by pennmom36 from I'M NEVER MOWING MY GRASS AGAIN! Look closely, no, look really closely, because under your feet exists an entire Kingdom of teeny tiny people! These tiny little people are having some very large problems, the rivers are drying up! The Kingdom of Brie was once a luscious and beautiful kingdom, but when the river began to dry up, its citizens began to get nervous, without water, no one can survive. King Oliver decided to hold a tournament that would allow a hero to rise, a hero that could set off on a journey to find the cause of the drought, and hopefully solve the issues. Of course, that tiny Hero, is you! I love the creative graphics, ladders made of matchsticks, spoons and forks as decorations, and even an axe made from a pop top soda can! These people are so tiny, they make little creatures of the forest seem huge. In the Collector's Edition version, there are 16 Collectible Coins to find (even these tiny people have to pay taxes) and 20 Collectible Dolls as well as the usual CE extras, but Brave Giant devs never let you access most of the extras until after you complete the game. 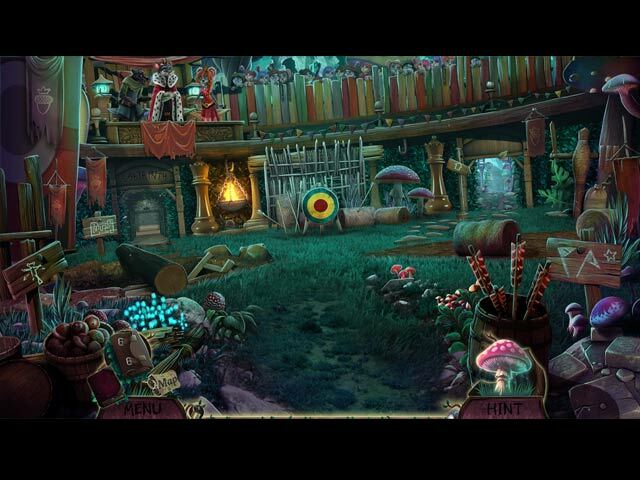 The Hidden Object Scenes were average, neither good nor bad. Most of the HOP's require you to find Multiples of items such as tokens or coins, but there are also Fragmented item finds and Silhouetted Shape finds (with silhouetted shapes that are just as tiny as the citizens) In the CE you can play an alternate Monaco Card game which seems to be available in most of Brave Giants games, just like their previous game Ghost Files. The Mini Games are fairly easy to solve, and nothing really new is presented. Below are brief descriptions of some of the games you'll encounter during the demo: 1) Answer the questions by locating the items that the rat is wearing. 2) Select the tiles floating around the rat to reveal the colors and then find its match in order to charge the spell. 3) Slide tiles to create an opening. 4) Find the symbols shown in each scene, covered by acorns. 5) Click on the target to stop the balls when they are in the red circle. 6) Cross the path using a balancing rod by adjusting the direction with the mouse. 7) Pass through all of the points only once. 8) Rearrange tokens so that adjacent tiles have something in common. The Collector's Edition has 8 Wallpapers, 8 Concept Art pictures, 5 Music Soundtracks, Movie Video Cutscenes, replayable Hidden Object Scenes, replayable Mini Games, Achievements to earn, 20 Collectible Coins, 20 Collectible Dolls, a built in Strategy Guide and a Bonus Chapter, enjoy!